2010. Pen & ink. 5½" x 7¼"
For our 2010 family Christmas card, I depicted my daughters making cookies, and also making a big mess in the process. 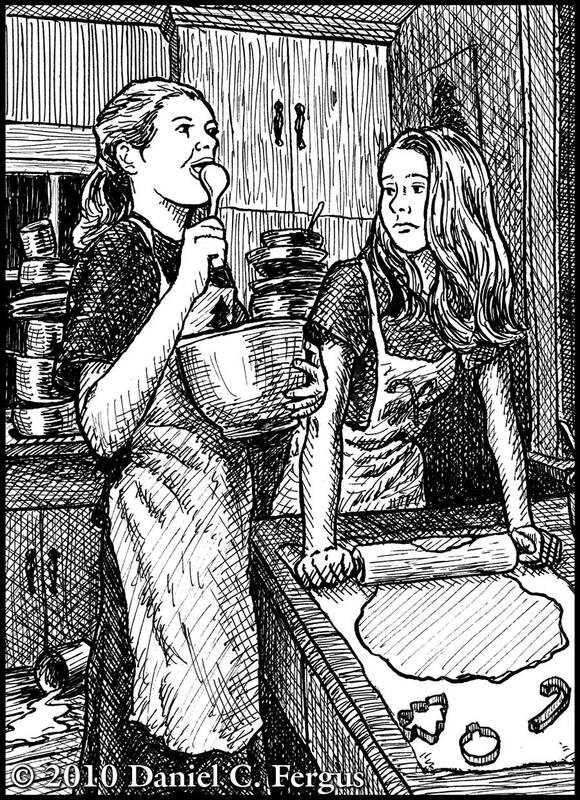 However, my older daughter, Rachel (on the right), would be upset if I didn’t point out that this is a fictional portrayal—they didn’t really make cookies, nor did they make a big mess like this, in fact she’s actually a bit of a “neat freak.” The illustration does show our actual kitchen however (fake wood laminate cabinets and all). The table with the beveled edge was built by my grandfather by hand, and passed down to my mother, and then to us.